With React Native being used by small to big organizations, there is a greater chance that minds of aspiring developers have been scattered with the cloud of doubts as of which technology is more suitable to develop the iOS applications. With this article, we are hoping to clear some of these doubts by comparing React Native vs Swift on the basis of several key factors such as performance, application size, user experience, testing and debugging, integration with CI/ CD tools and many more. a To-do list screen where tasks can be added, modified and deleted. We used Xcode software instruments to analyze the CPU load and memory allocation in this benchmarking study. Memory allocation: While scrolling down the list infinitely multiple times, We observed that Swift application consumes about 0.65% more memory than React Native application. CPU usage: App developed in React Native shows an average of 85% CPU consumption and about 129% of peak CPU usage. On the other hand, App developed in Swift shows an average of 27% of CPU allocation and about 47% peak CPU allocation. Clearly, Swift emerged as a winner here. Memory allocation – As seen in the graph above, there is no big difference in React Native and Swift application when we added and deleted multiple tasks in the list. CPU consumption – The graph above shows that React Native application consumes about 66% of average CPU usage while Swift application consumes about 10% of average CPU usage. CPU consumption – Swift application shows an average of 14% CPU utilization while adding multiple tasks to the list. On the other hand, React Native application uses 111% CPU allocation doing the same on an average. Memory allocation – The above graph illustrates the memory allocation of React Native and Swift apps while scrolling up the list in the app multiple times. As you can see (See Memory allocation graph), the graph for Swift application stays flat throughout the whole scrolling process. On the other hand, the graph for React Native shows the high reach at the start, low in the middle and again high reach in the end. CPU Usage – While scrolling up multiple times, the Swift application shows an average of 35% CPU while the React Native application utilize about 110% of CPU as an average. Memory allocation – The Memory allocation graph above illustrates that both Swift application and React Native application almost shows similar memory allocation at a constant rate. We observed an almost negligible difference between both Swift and React Native application in this case. CPU Usage – While navigating forth and back from the main screen to the todo list screen, We observed that Swift application utilize about 24% of CPU as an average while the React Native application shows an average utilization of 62% CPU in this case. The above benchmarking study done by us concludes that application written in React Native on an average consumes more CPU usage than the application written in Swift. When it comes to memory usage, React Native application utilize more memory when we added multiple tasks faster in the todo-list. In other cases such as scrolling and editing/ deleting tasks, Swift consumes more memory than React Native. 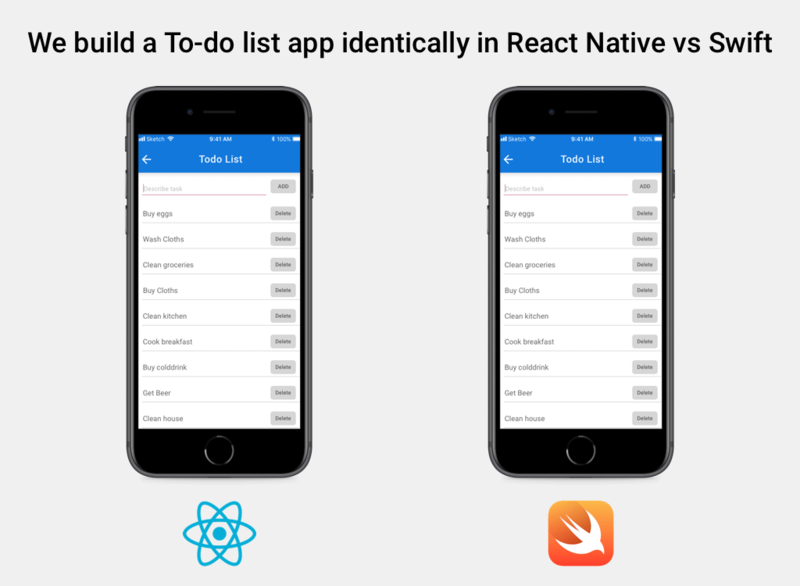 While navigating from the main screen to to-do list screen and vice-versa does not have any considerable amount of difference between both React Native and Swift applications. As seen in the image above, the application size of the application developed in React Native is 20.2 MB whereas the application size for Swift is 16.2 MB. This result implies that for application size Swift will outperform React Native. On the other hand, development of Swift application took about 2 months for the completion. Component testing using ReactTestUtils – ReactTestUtils is a framework for testing React components either in a visual of functional way. Integration testing using Mocha – React Native provides two components namely RCTestRunner and RCTestModule in order to run customized integrated tests. However, both of these posses limited functionalities. Hence, there is a good alternative framework called as Mocha which provides wholesome testing experience (including unit and integration tests). Mocha is also proven to be as an essential framework providing behavior-driven-development (BDD) and test-driven development (TDD) approach to developers. React Native apps are basically native apps. That is why React Native supports most of the test automation frameworks with ease. An iOS app developed with React Native can be tested with XCTest – a testing framework by apple which comes tightly coupled with Xcode. XCTest provides developers to test UI while writing tests for components at any level. KIF (“Keep it functional”) is another iOS test automation framework which uses XCTest test targets. Tests written using KIF can be executed directly in XCTest case or any subclass. Apart from XCode, other automation frameworks combination such as Appium + Robot framework allows developers to automate test cases for UI testing. Calabash based on cucumber is also most widely used behavior-driven development framework which can be used for automation. In iOS, Xcode ships XCTest framework which is most widely used for UI tests. XCTest provides a smart solution for writing UI tests for the iOS app by screen capturing developer’s interaction with the app. It records developers actions such as taps, swipes etc and convert these actions into code inside the test cases. However, developers have to make some assertions at the end as sometimes the code which is automatically converted might be an invalid code. When a UI tests fail, developers can actually skim through the whole process and see what went wrong. React Native and Swift are the future of app development. Get our insights on whether you should build your iOS application with React Native or Swift. React Native has a good support from third-party libraries which keeps on multiplying every year due to mind-boggling support from its community. In fact, npm is the richest source for third party library manager in the case of React Native. For iOS – these third parties can be installed by linking them to Xcode either in a manual way or either automatically using rnpm links. Although React Native do support a vast number of 3rd party APIs, there are still some requirements which are needed to be met in terms of supporting APIs through native modules. React Native developers are reportedly working on fixing the same as of writing this article. With react native, we have seen a big challenge to keep 3rd party libraries and APIs updated, as there’s nothing to keep track and notify developers on what packages/libraries/APIs requires updation. With Swift, this isn’t a challenge anymore. Apple’s Cocoapods allows developers to easily manage and maintain updated 3rd party libraries and APIs. If any package requires an update, the developer gets notified. Thereby, increasing the maintainability of your Swift project. Building production/ enterprise-ready app with React Native is a challenging aspect for developers to follow as there are many performance issues and limitations of React Native that may entice a risk-level in a project. However, once these aspects are known, developers can hopefully taste success through their efforts. Swift syntax is clear and concise which makes it a better fit for enterprise built projects. Moreover, Swift require lesser code with high optimal performance – this makes it an optimal choice for cloud-based development and deployment. In addition to performance, Swift provides many interesting features to iOS developers such as error handling system, memory management, optional types and protocol-oriented architecture. Swift facilitates opportunities to create enterprise apps to drive employee productivity and to accelerate the enterprise performance. In general, enterprise apps have slow startup time due to their big application size. However, an app development in Swift uses dynamic libraries that can be directly uploaded from the memory which is optimal for its performance. More commonly, the sole fact that Swift hails from a renowned key player such as Apple has made it adopted by businesses at a rapid pace which contributes to its enterprise growth. Apple is reportedly cracking down on developers who use SDKs to roll out the features without App store approval. That said, OTA updates in the case of iOS will be still cumbersome in React Native if your app is using some frameworks such as Rollout.io, JSPatch to roll out changes. Apart from code push, Over-the-air updates in React Native can be managed by using Electrode – which is an independent platform developed by WalmartLabs. Swift does not support any OTA updates as of writing this article. Ever since the initial launch of React Native, its core contributors and developers team have introduced numerous Navigation solution to navigate through your app for iOS such as navigatorIOS, NavigatorExperimental, React native router flux etc. Although, many developers had significantly raised issues in the past in these solutions as they experienced many performance glitches in the UI of their app. An application developed in Swift seamlessly integrate with the platform/ framework on which it has been developed. Henceforth, it contributes to a slightly better user experience than a React Native app. IT and Banking – SOX in Information technology and Banking organizations. Finance – Finance – Data Protection Act (DPA), GLBA(Gramm Leach Bliley Act) for consumer data protection in Financial Corporations. In terms of Maintainability, React Native has an issue with the compatibility of 3rd party libraries and frequent release cycles. That said, frequent React Native release cycles are always a problem as the code becomes old and maintained to an extent where the libraries can’t match the update. Moreover, at the time of writing this article, React Native still has many unresolved issues which are needed to be fixed as soon as possible. Swift is a statically-typed language which is easier to read and maintain. Developers can rely on XCode which is helpful to track errors while building their mobile app. Being a compact language, swift requires lesser code to perform the same tasks than its language counterpart Objective C. For instance: recently Lyft – a transportation company has re-engineered their mobile app using Swift. In their case, Swift allows Lyft to reduce their code base by over 70% thereby keeping the same performance and functionality in their app. Developers can store their data in React Native using AsyncStorage API. However, the API is not secure by default. Keychain Services API – This API provides you to securely store your passwords, keys, etc. Cryptographic Message Syntax – This is a good API to use when you want to encrypt your data for store-and-forward applications data such as an email. iOS Common Crypto Library – It allows developers to store and protect their data in Swift applications by adopting AES standard of encryption. RNCryptor is a source library available on Github that supports AES encryption. On the other hand, developers are also free to write their own encryption code if their app deals with more sensitive data or information. React Native has a great support from its community members on Github, StackOverflow, and StackExchange. Facebook community of React Native is one of the best source of getting useful information and guidance about React Native app development. Naive React Native developers find it easy to solve any specific issue with the help of guidance from this helpful community members. Furthermore, lots of events take place all over the world focusing on React Native. Most common ones are in the form of React Native meetups where developers from different places take participate and share information on their part. The Swift community is more welcoming for new developers whether it be slack, Github, StackOverflow or any third part forum. In fact, Swift has over 110 meetup groups with about 40k members worldwide. It also has a slack channel which is more supportive and helpful for developers to clear their doubts. So, React Native or Swift – which should be given preference while developing an iOS application? Well, there is no hard rule. It all depends on your project requirement and complexity. For starters – if you are starting in the field of iOS application development then look no further from Swift. I know it has a steep learning curve but considering your main focus is to learn developing an iOS app, it is a worthwhile choice to be considered. Furthermore, if you are required to deliver a simpler iOS app which has a limited deadline (Say 1-2 months) then React Native will be the worthy option to choose for. For complex application requirements, Swift will be the best option to be considered. Learn everything you need to know about React native for your organization!